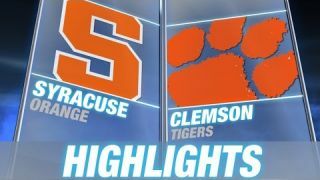 The Clemson defense played stellar Saturday night, holding Syracuse to 170 total yards of offense, collecting 4 sacks and forcing 3 turnovers while taking down the Orange 16-6. Clemson running back Wayne Gallman rushed for a career-high 101-yards while TE Stanton Seckinger recorded the only Clemson touchdown in the 4th quarter. The Tigers improve to 6-2 on the season while the Orange move to 3-5.